Welcome to the 2017 Baldies Awards, where we honor the outstanding achievements in film and television for the year! This particular episode features what we call "deliberations" which is a behind the scene look at how we arrived at our various picks for the Baldies proper. You SHOULD start by listening to the 2017 Baldies Awards Ceremony, then you can drill down to whatever sub-category you're interested in / outraged with the most. 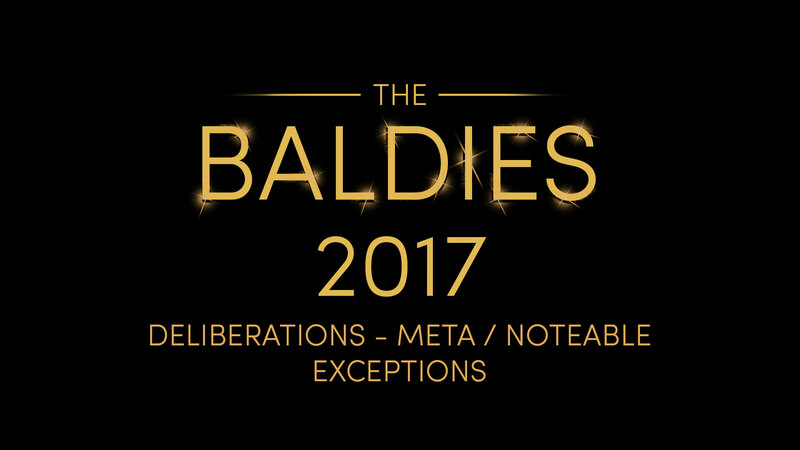 This 2017 Baldies Awards deliberation is on "Meta & Notable Exceptions"! We talk about trends in television, podcasting, and why some otherwise noteworthy shows didn't make our lists.